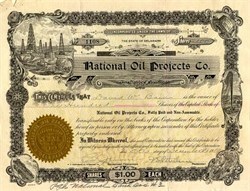 Beautiful certificate from the National Oil Projects issued in 1919. 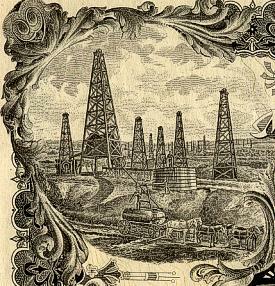 This historic document was printed by Goes Banknote Company and has an ornate border around it with a vignette of a field of oil wells . This item has the signatures of the Company's President and Secretary and is over 88 years old. Cut in upper left corner on white margin which does not affect printed border.